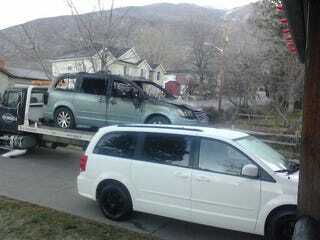 New Vanjo, Say Good-Bye to Satin Spawn, Garage-Burning Vanjo. My Van decided to emolliate itself Friday night thanks to a failed wiring harness. A should-have-been replaced harness that was splashed with battery acid six years ago ignited and destroyed my garage and melted my mini. Got a new Van from Carmax with warranty. Got an Abarth with $6,500 in 2013 rebates. Hopefully I can get all new tools and much stuff that was burned and melted. Thank goodness for the Fire Department and Farmers!